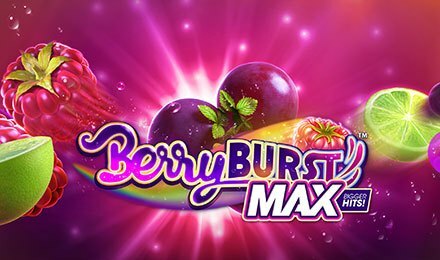 Experience a burst of fruity flavours on Berryburst Max Slot! Created by NetEnt, it is now playable at Vegas Spins. With 5 reels and the Cluster Pays™ mechanism, it takes you to the colourful world of fruits. It is set against a red-orange backdrop and transparent reels which contain symbols like the Raspberry, Lime, Orange Slice, Berries, Diamond, Heart and Spade. The raspberry is the top-paying symbol which can make you trigger up to 10,000 coins. Play this rewarding game using any device at Vegas Spins! Start by selecting your desired amount on the Coin Value display by toggling the + and – buttons. Want to go for the highest bet on Berryburst Max Slot? Press the Max Bet tab which allows you to do so in a single click. Next, hit the Spin button to begin. Another option is Auto Play which lets you enjoy 10, 25, 50, 100, 250, 500, 750 and 1000 automated games. Bet Levels: Pick 1 to 10 bet levels. Amount of Paylines Selection: Paylines are not available as the Cluster Pays™ mechanism is active. Coin Values: You can choose the following coin values for your gameplay: £0.01, £0.02, £0.05, £0.10, £0.20, £0.50, £1.00 and £2.00. The wild symbol on Berryburst Max Slot is the Ice Cube engraved with a neon W. It can replace any other symbols to complete winning combinations while it appears anywhere during the base game and re-spins. When you land 1 or more Wilds on the reels, they expand to cover the whole reel while a re-spin is triggered. Since the Cluster Pays™ mechanism is used, when a symbol is horizontally or vertically adjacent to another identical one, it becomes part of a cluster. If a cluster contains 6 or more Wilds, the symbols on either side are substituted. But if the entire screen is filled with Wild icons, those forming a cluster do not replace the symbols on each side. Wild symbols on Berryburst Max Slot expand and fill up an entire reel. They also stay in the same position while the other reels perform re-spins. Before a re-spin is launched and after the Wilds are all expanded, the winnings are awarded. When the re-spin ends, any new Wilds also expand in the same manner, while the initial spin and payouts are evaluated. If one or more Wilds appear anywhere during the Re-spin Feature, an extra re-spin is awarded. An explosion of flavours awaits on Berryburst Max Slot at Vegas Spins. Relish this experience and best of luck!